Johnson College is one of the premier institutions of learning in northeastern Pennsylvania. It has been serving the need of students since 1912. On this fall morning, Kitch and I drove to this beautiful campus to attend a special “Lunch & Learn” event featuring Atty. 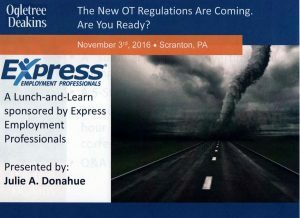 Julie Donahue, a member of the Philadelphia law firm Olgetree and Deakins and motivational speaker and author Eric Chester. 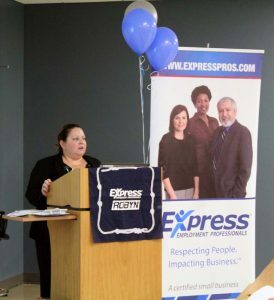 This unique learning experience was organized by Amy Clegg and her staff at the Express Pros office in Scranton. Attorney Julie Donahue is a soft-spoken, analytical person. She received her undergraduate degree from Loyola College in Maryland and her lawdegree with honors from Temple University Beasley School of Law. She also handles matters relating to wrongful discharge, breach of contract and grievance arbitrations. On this November morning, she informed her audience about the new Department of Labor overtime regulations that will go into effect in December. According to Atty. 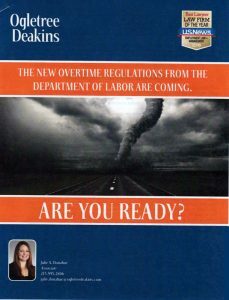 Donahue, the Department of Labor has been broadening the legal rights and protections afforded to workers through its power to administer several statutes. To help people better understand the complexities of these changes, she provided everyone in the room with a printed copy of her 34 page PowerPoint presentation. 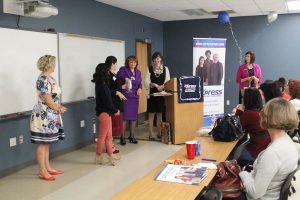 Her presentation was well organized, and she took the time to answer questions and clarify how employers could get prepared for these changes without alienating anyone. The handout also included two pages of Definitions and Examples. Her topic was complicated, but she found a way to make sure everyone in attendance had a better understanding of the many nuances of the new overtime regulations, but she did not stop there. In her thoughtful way, she made sure that everyone had printed materials that would help clarify the issues long after the conference ended. 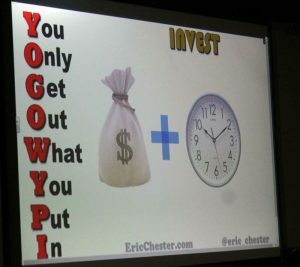 “Everyone should ask themselves everyday… “What am I doing today, to make my craft better?” – Eric Chester. 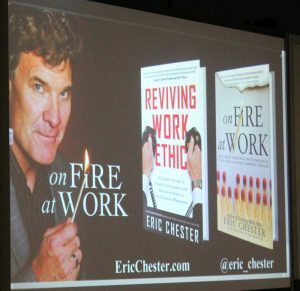 Eric Chester started his professional career as a teacher and coach. Today he is a celebrated motivational speaker and writer. To help leaders end entitlement and restore pride in the emerging workforce, he founded The Work Ethic Development Center. The centerpiece of this popular work ethic training curriculum is a training and certification program entitled Bring Your A-Game to Work. 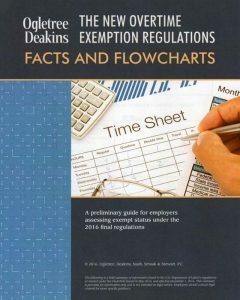 It is used in schools, universities and workforce centers. 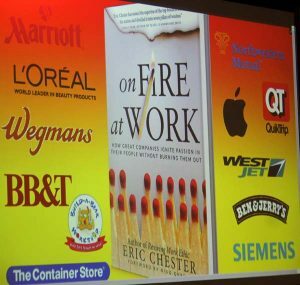 On Fire at Work: How Great Companies Ignite Passion in Their People without Burning Them Out. Work has degenerated to little more than a four letter word; a necessary evil. It’s no longer viewed as something to be proud of, but rather something to disdain, to shortcut, or to elude all together…It’s time to revive work ethic. – Eric Chester. 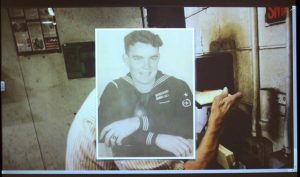 To set the tone for his remarks and to help people better understand his central thesis, he told a story about Bob Knops a Korean War veteran who worked at Twin City Wire Company for 59 years. Mr. Knops never missed a day of work. Mr. Knops’ accomplishment grew out of his work ethic. He was positive and enthusiastic. He showed up for work on time. He was dressed and prepared properly. He did more than was required of him. He was honest, and he played by the rules. He was pleasant and he gave friendly service. Instilling those seven attributes into the hearts and minds of the emerging workforce is the key to keeping our companies, and our country, stable and prosperous. 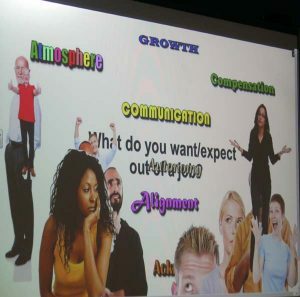 Using a special graphic, he explained how important values are in the workplace. What do you expect out of your job? Then he effectively related these objectives to the seven elements of the work ethic. According to Chester, when both sides’ needs are met, it is called engagement. The best way to recruit is to offer an unbeatable culture. The Apple Store is one of Eric Chester’s favorite examples. It hires “geniuses” not sales clerks, and its culture is deeply rooted in acknowledgement. He pulls no punches. He is quick to admit that it takes time and money to get good employees, but you only get out what you put in. Live an active life among people who are doing worthwhile things, keep eyes and ears and mind and heart open to absorb truth, and then tell of the things you know, as if you know them. The world will listen, for the world loves nothing so much as real life. Eric Chester relates to people of all ages because he is genuine. One can best describe the atmosphere of this Express Employment Professionals Webinar event by paraphrasing the words of F. Scott Fitzgerald. The beauty and meaningfulness of this event is found in the reality that your needs are universal needs. You are not isolated from anyone. You belong.